This week the workbench focus was on Chinese Imperial troops for my Boxer Rebellion collection. I completed the painting of 80 figures: 43 Old Glory 15s (green facings) and 36 Blue Moon (yellow facings) plus one modified mounted Chinese officer (part Old Glory 15s and part Blue Moon). I should mention that I repainted the Chinese Imperials troops I did last week because I thought/think the uniforms needed to be a darker blue. My last workbench project for the week had nothing to do with the Boxer Rebellion. For several months now I have been collecting Star Wars figures (mostly Wizards of the Coast and Action Fleet) for a future Star Wars’ project. Wizards of the Coast has 6 different Ewok poses, but none are distinctly female. In 1998 Hallmark made a Christmas decoration pack with three Ewoks… one a mother and baby. Yesterday I decided to modify one of my spear-carrying Wizards of the Coast Ewoks to come as close to that Hallmark mother and baby as I could get. I cut off the spear and a knife hanging at the Ewok’s side. I made a baby Ewok out of Milliput and placed it in the arms of the former spear-carrier. When it gets painted I think it will look pretty good… I’ll probably do a couple more. Since I will be having cataract surgery on Monday the coming week’s workbench will not see much work done though I do hope to do some work/painting on 9 more Blue Moon Chinese Imperial troops before going in for surgery. This week’s workbench brought to a conclusion my work on my force of Boxers. I finished 63 Boxers this week bringing the total number of figures in my Boxer army to 501. On Saturday I managed to squeeze in the first 9 figures for my Chinese Imperial Army… these are Old Glory 15s (ground cover not complete yet). All of my Chinese Imperial infantry (Old Glory and Blue Moon) will be dressed in European-style uniforms. Next week and for a few weeks to come my workbench time will be spent painting those Chinese Imperial Army figures. While my painting references include Osprey material (Men-At-Arms 95 and 505), my primary source for this work is the Foundry Book Publication entitled Armies of the Nineteenth Century: Asia/China. This week’s workbench ends with 60 more Boxers completed which takes the total finished to 438. Next week the things of life will take me away from the workbench quite a bit, but there is a chance that I will be wrapping up the Boxer painting portion of this project in the next week… just a chance. 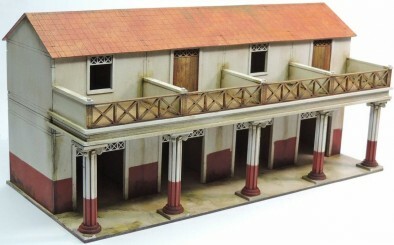 On the planning side of the workbench I have been thinking for awhile about my 28mm gladiator arena. After years of collecting I now have all the parts to give the Playmobil gladiator arena the look I want. Consequently, I’ve been thinking about what the neighborhood that surrounds the arena should look like. 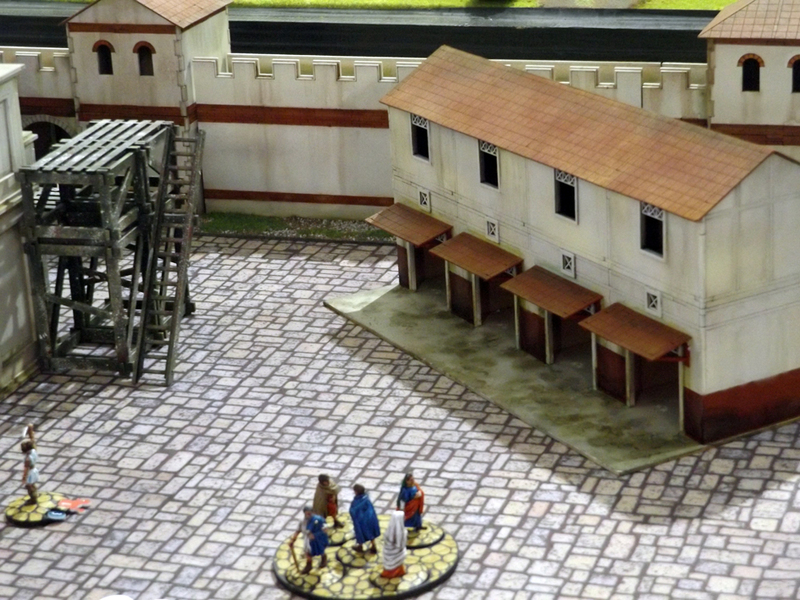 For a long time I believed that those buildings would have to be scratch built, but in recent months, Footsore Miniatures has come out with a very nice line of Roman shops and warehouses for their Gangs of Rome line of 28mm figures. Yesterday I took the plunge and order 11 of them. I’ve attached a few of their advertising pictures that will give an idea of what these buildings look like. The workbench continued with Boxers. This week saw the completion of an additional 57 figures that included six command bases characterized by the presence of musicians. That takes my total of completed Boxers as of this writing to 378. I have just over 100 left to paint. Part of my hobby time this week was focused on a rather wonderful email I received on Monday. That email was from the editor of one of the best-known miniature wargaming and miniature role-playing magazines in the world. The reason for his writing was to say that they were interested in including my miniatures in the magazine. My posting of my Post Apocalytic Gallery/Between LA And Las Vegas, either on War In 15 or on Lead Adventure Forum, had caught the magazine’s attention. Of course, I told him I would be very happy to do that, and as our conversation continued, it turned out that the magazine would be interested in publishing elements of other galleries as well… thus more than one issue would be involved. As a result of those emails (several were involved), I have been doing write-ups for several of the collections and using WeTransfer to send those write-ups and related galleries to the editor. At this time I have no idea what issue(s) my collection(s) will appear, but there is no doubt that he is serious about their inclusion. As some of you may know in 2009, when War In 15MM was still a very small website, my collections were the subject of a feature interview in Wargames, Soldiers and Strategy (Issue 46). I will admit that having my work recognized by what I see on the shelf when I go to Brookhurst Hobbies is exciting. I’m including a picture of the cover of Issue 46 of Wargames, Soldiers and Strategy to add a little variety to this week’s workbench photos, and because I like it… it actually has my name of the cover.